The screening will be accompanied live by the electronic duo "Bazalt" (Oslo). The project "Between C & D" was supported by the BKV - Billedskunstnernes Vederlagsfond. at the FINISSAGE of DIMITRI LURIE & BEATE PETERSEN exhibition INTO YOUR HANDS. Opening on Saturday, 20.01 at 14.00. Minimalen' 2018 - Тhe 30-th Short film festival in Trondheim (NO). of the Nordic short film competition program NOR 3, and on Thursday 25.01, h.11.00 at the Kino Nova. cross-disciplinary event materializing in Oslo to mark the longest night of the year. Video work for the art "Debates on Division: When Private Becomes Public." in the competition programm of the new short films from Nordic countries. "Refraction" to be screened as part of the program from the Cyland video archive “Changing Landscapes” curated by Vika Ilyushkina - a visual artist and curator from St. Petersburg. Our video installation "Conversions" / "Обращения" is nominated the presigiouse Kuryohin' Art Award in the category Best Media Object. The winners to be annonced on the 17-th of April during the ceremony at the Sergey Kuryohin Art Center in St. Petersburg. Dmitri Lurie is among the 68 contemporary artists whose works are displayed in The Museum of Moscow under the exhibition titled "The Other Capital". The exhibition is conceived as a metaphor and an alternative plan for the city of St. Petersburg, collected from the works of important for its art scene authors. Paintings, installations, objects, multi-media and photography were selected by curators of the two cities - Eugene Kikodze (Museum of Moscow) and Olesya Turkina (The State Russian Museum) who're defining the key theme of this project as "artists understanding of their cultural background and heritage, the city of St. Petersburg is famous for." Among the participants are only modern artists representing different generations of unofficial art and important currents of the St. Petersburg underground from the 60-th to the present days. Organized by: The Museum of Moscow, St. Petersburg' branch of the National Centre for Contemporrary Art - NCCA and the art gallery Anna Nova. Our appearance at the opening of this project was made possible with a kind support from the Royal Norwegian Embassy in Moscow. Тhe videoinstallation "Conversions" was on display as within an exhibition project "Manifest. Pulse 1." that took place at the central exhibition hall "Manezh" in St. Petersburg. The appearence of our work at the exhibition is made possible with an International support from OCA - office for contemporary art Norway and the General Norwegian consulate in St. Petersburg. Dimitri Lurie presents his work "Ginger-Space Waltz" at the exhibition "Ginger-Brain-Logic" curated by Farhad Kalantari. The finissag and Artist Talk along with Inger Lise Hansen in conversation with the exhibiting artis takes place on the 28. March. The support band of the night were the young musicians from Volda (Norway) "My Descending Ark" for whom the concert at Revolver turned to be a debut in the capital town. 8 feb. - 9 march, Black Box, Gislaveds Konsthall in Sweden. 3. July, Video art Festival Miden 2014 in Kalamata, Greece. 25. June, The Youth Educational Center of The State Hermitage, St. Petersburg. 17 - 18. June 5.3 Art Vilnius, Conference Hall, Vilnius, Litauen. 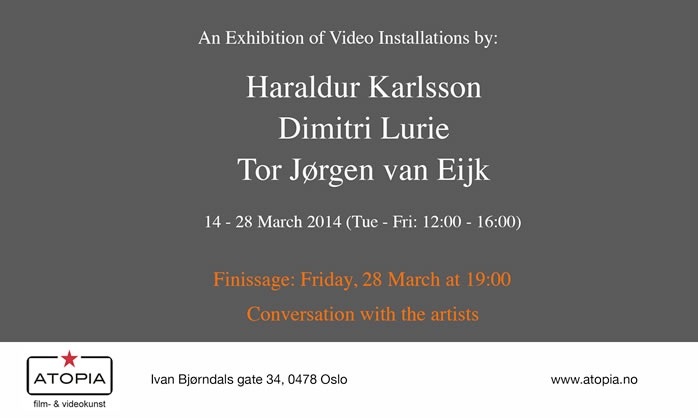 8 feb. - 9 march, Black Box, Gislaveds Konsthall, Sweden. 18 December, "Capital of Nowhere", New Museum of Modern Art, St. Petersburg. Held annually since 2007, CYBERFEST is the first and biggest festival for technologically based art in Russia. This year, it will be held from 12 to 17 November at The WYE in Kreuzberg, Berlin. The festival's video program "Changing Landscapes", including Lurie's "Refraction", will be screened on 14. November at 19.30 at Platoon Kunsthalle - Berlin, Schönhauser Allee 9. The jury of "The XII. International Kansk Video Festival" awarded with special diploma "For the awakening of nostalgia to an event that hasn't yet happened", Dimitri Lurie's film "Refraction". The film premiered in August 2012 in the competition program of "The 8-th International Festival of Short and Animation Film "Open Cinema" in St. Petersburg. Since then it was shown at various film festivals and art exhibitions around the globe. "A Sense of a Maze" is one of 144 artists selected for the second round out of 2300 applicants. The creative documentary "A Sense of a Maze" (52 min) - was released in November 2010 in Dom Kino of St. Petersburg at the International Film Festival "XIII. DeboshirFilm - Pure Dreams". Where the jury has awarded our work with the distinction «For the authors' highly poetic cinema message. "Refraction" is screened at athe joint new-media exhibition "Capital of Nowhere" held in Venice by CSAR and Cyland during the time of the Venice Biennale. Dimitri Lurie & Vera Mokhova are once again participating in the annual art festival Oslo Open. We open doors to our studio & showroom and welcome respectable public to meet our work. Our studio is on the list for a guided tour. Film "A Sense of a Maze" will be screened at UKS cinema under the Oslo Open's video program. 23 March, 16:30 "Open Cinema Club", Dom Benua, St. Petersburg. Our film "Flashes of Persia" is shown under the program "Masala mama" - short films from India, Iran, Singapore and Thailand introduced by the Open Cinema Club. 19 Jan. - 23 March, Smiths Row Gallery, Bury St Edmunds, England. Dimitri Lurie took part in a joint exhibition "Flicker: Artist & Super 8" - a homage to the art of Super 8-mm film. The exhibition aims to showcase the diverse use of Super 8 in contemporary artistic practice, from installations and performances through to film screenings and talks. Along with work of the contemporary artists and filmmakers on display was a film by Derek Jarman. The shows review at East Anglian Daily Times. 9 - 10 March, Oslo international church music festival. Vera Mokhova stands back the baroque costumes for a church concert-performance "Vivaldi for children". Our short film "Aftertaste" is taking part in an on-line film festival Humanity Explored, arranged by Cultural Unplugged studios of the LinkTV channel. Here film viewers from all over the world can watch, vote and support the storytellers they like. Vera Mokhova designed costumes for this year' series of a popular TV show for kids - "Julemorgen / Christmas morning"
produced by the Norwegian Broadcasting Corporation - NRK. Three video works by Dimitri Lurie - "Samsara-Vertigo","The ginger space waltz" and "Turbulent sacrifice" - will be screened in the program presented by the Media Art Lab Cyland at the 3rd edition of the Video Guerrilha festival in Brazil run by the cultural organization Videofarm.